Beyond an olive grove in opposition-held northwestern Syria, rebel fighter Zakaria Abdelwahhab, 29, dashes across the astroturf towards the football, hoping to score a goal for his lost hometown. Seven years into the civil war, Abdelwahhab is one of tens of thousands of Syrians who have sought refuge in Idlib province after fleeing other parts of the country. This month, to forget the daily grind and make new friends, he and others formed teams representing their town of origin for a tournament in the provincial capital. “I took part to relax and to meet and befriend people who left” their hometowns too, says Abdelwahhab, who hails from Madaya in the Damascus countryside. But “we also want to get to know Idlib people better. Even now, we don’t know many of them,” says the skinny, bearded player, wearing his team’s grey T-shirt and a black cap. “Today, we played against the team of the Banafsij NGO from Idlib and lost really badly — something like 14-3,” he says, laughing. With arrivals from other parts of the country, Idlib’s population has swollen to 2.5 million — around half of them displaced. The Russia-backed government has regained large swathes of the country in the past two years, through a combination of stifling sieges, deadly assaults and negotiated surrenders. Under these, rebels and family members unwilling to be ruled by the government are bused to areas still under opposition control in the north of the country. 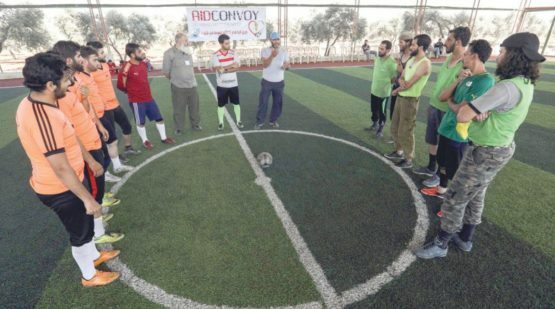 This month, those who arrived in Idlib are grouping into small football teams of five players plus a goalkeeper to play each other and sides from their host province. “No full teams arrived here from their areas, because there are people who died, stayed in regime areas, or left” for other districts, says Abdelwahhab. He, his wife and son left their home and fruit trees behind in Madaya after enduring a crippling government siege. The last rebels left the town in April last year, after government forces surrounded it completely in 2015. “We were besieged by death,” says Abdelwahhab of the siege in which dozens died from acute malnutrition. In Idlib, Abdelwahhab says he and his family struggle to get by on a stipend of $50 to $60 he receives from time to time from a rebel group. Since it started in 2011 with the brutal repression of anti-government protests, the Syrian civil war has killed more than 350,000 people and displaced millions. Another player, Mohammed Nasser, says he is taking part in the tournament, which is to last until August 25, to find a sense of belonging in internal exile. “Yes, people in Idlib are our people too and they’ve been nothing but good to us, but you still need to feel like you belong,” said Nasser, dressed in an orange T-shirt. Before being displaced by the conflict, Nasser was a sports coach at an orphanage in his hometown of Western Qalamun outside the capital, he says. He spent four years in a camp across the border in Lebanon, before last year heading to Idlib, where he says his landlord has generously refused to let him pay rent. In Idlib, “there are more work opportunities, and when it comes to sports, it’s better for relaxing and having fun than before the displacement,” he says. But after gains around the capital and in the south this year, President Bashar al-Assad has threatened to next retake control of Idlib, most of which is held by rebels and jihadists. In this context, the football tournament is also a message of defiance to the president, Nasser says. “Despite everything that you want to do — from bombing to killing to destruction — we’re still living our lives and we’re happy,” he says.